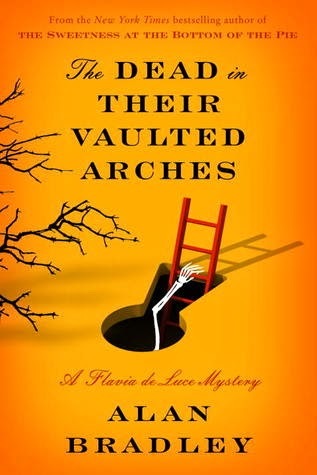 After I finished Speaking from Among the Bones, the fifth Flavia de Luce mystery, I had a hard time keeping myself from reading The Dead in Their Vaulted Arches, especially since it was sitting on my eReader already, thanks to NetGalley. When the previous book ended, Flavia de Luce, still 11, and her sisters Feeley (Ophelia) and Daffy (Daphne) had just received the stunning news from their father that their mother was coming home to Buckshaw. Harriet de Luce had left on a hiking trip through the Himalayas a year after Flavia was born and had fallen to her death. Now, her body has been found in an icy crevice and is being returned for burial. And accompanying Harriet is none other than Winston Churchill. Two odd things occur while Flavia is standing on the train platform after Harriet's coffin arrived accompanied by much pomp. First there is Churchill whispering in her ear, cryptically asking if she have developed a taste for Pheasant Sandwiches yet, and second, just as a tall man whispers to her that the Gamekeeper is in jeopardy, he is pushed to his death on the train tracks. Now, Flavia has two mysteries to solve while trying to sort out her feelings about the mother she never really got to know. And on top of that, Flavia may have met her match when her younger, smart-as-a -whip cousin Undine arrives accompanied by her mother, Cousin Lena de Luce from Cornwall. If you are a Flavia follower, you already know that Buckshaw, the rundown family estate owned by Harriet and bled dry by His Majesty's Board of Inland Revenue or the Forces of Darkness, as Flavia's father, Haviland de Luce, calls them, is up for sale, since no will of Harriet's was ever found. So when Flavia gets the cockamamie idea that she can resurrect her dead mother through chemistry, the only thing she manages to accomplish is finding a copy of Harriet's until now missing will in a pocket before she must leave the room. Can the will save Buchshaw from being sold? It doesn't take Flavia long to figure out that Harriet didn't have an accidental fatal fall, but like the man on the station platform, she was pushed to her death. Who pushed Harriet and why they did it add to the mystery of the cryptic Pheasant Sandwiches comment, discovering who the Gamekeeper is and why they are in jeopardy, who pushed the man off the platform and why. And it all harkens back to World War II. The Dead in Their Vaulted Arches is a difficult book to properly review without giving too much of the mysteries away, even though by the time I finished reading, I realized that the mysteries were not the central part of the story, merely a vehicle for what was to come next. Because Book #6 in the Flavia de Luce series is really a transition novel. And while the mysteries aren't great, the tone of the book is much more serious than usual. Cousin Undine and her antics happily provides some relief from that. Undine starts out rather bratty, but ends up as a much better character and a bit of a foil for Flavia. Which is good since Flavia is not her customary smart-mouthed self. So, all of the open questions that have followed Flavia throughout the series are answered in this novel. Flavia is just about ready to turn 12, and not only do we see Flavia changing, but her circumstances do too. It is the end of the series? No, indeed. Bradley has 4 more Flavia de Luce books planned. Even though The Dead in Their Vaulted Arches was not the usual Flavia mystery, it is still really good. But, and it's a big BUT, I don't know that it would work well as a stand alone novel. It might be better to read an earlier Flavia novel first, to get more information and a better feel for recurring characters and circumstances, even though now change is in the air. What will the future hold for our young heroine? I can't wait to see what happens to Flavia de Luce once she turns 12.